Euro 2012 is a huge moment in the footballing histories of both Poland and Ukraine. Editor's note - Pedro Pinto will be interviewing UEFA president Michel Platini on Friday and we want your questions. Whether you want to quiz him on his expectations for Euro 2012 or the quality of this year's Champions League, leave your questions below and we'll put the best to him. 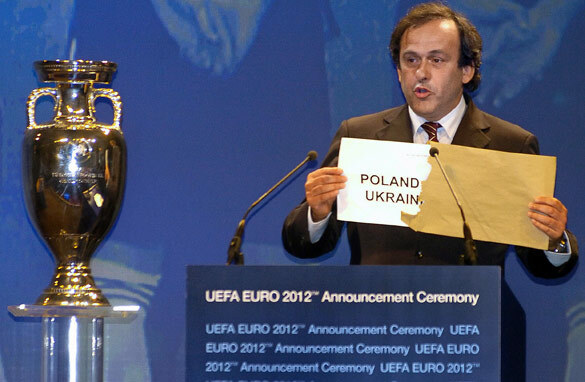 When UEFA picked Poland and Ukraine to co-host Euro 2012, there were those who questioned the decision. After all, Eastern Europe had never organized a tournament of such magnitude and there were concerns the duo would struggle to deliver the necessary infrastructure to make the event a success. To be fair, those concerns were warranted, especially in the Ukraine. The government that was in charge until 2010 did little to justify the confidence placed in them by Michel Platini, the president of European football's governing body. There were severe delays in the construction of stadiums, roads, airports and hotels. The organizing committee changed personnel various times and it got to a point where no-one knew who was in charge any more. The situation got so bad that UEFA threatened to take the tournament away from Ukraine and give all of the matches to Poland. There were even rumours that Germany could be called in to help out. But over the last 18 months, the rhetoric has been quite different. There were several stories on how big improvements to the work rate had been made, and the inauguration of several stadiums in both host nations gave fans around the world belief this European Championships would be a great one. Still, it was with some scepticism that I travelled to Poland and Ukraine this week for CNN's Special Coverage of the build-up to Euro 2012. I wondered how these nations were preparing and whether the necessary infrastructure was in place or on pace for the start of the event? Well, having spent the last week travelling across both countries I can tell you that if you are a football supporter, you needn't worry. The stadiums look great and although some of the roads and railways may not be completed by the start of the tournament, enough progress will have been made to make the fan experience a good one. Let me tell you what my main impressions have been. Warsaw and Kiev are both fantastic cities where people love football and follow their local teams passionately. Everyone I have spoken to is thrilled the European Championships is coming to town and can't wait to support their teams, even though they are aware both Poland and Ukraine have only an outside chance of lifting the trophy on July 1. Ukrainian football legend Andriy Shevchenko told me playing a Euro on home soil was a dream come true and he would love to make the final in his last competitive tournament with his national team. The most impressive stadium is the one in Donetsk where Shakhtar play their home games. The Donbass Arena is one of the most imposing structures I have seen in the world of football and no expense has been spared to make this the best possible stage. The place should be rocking when the national team plays two group matches there. As far as the other infrastructure is concerned, I am honestly impressed by the work Ukraine has been able to do in the last year-and-a-half. I saw pictures of what the hotels and airports looked like 12 months ago and in many cases there was little more than a hole in the ground. People have now worked around the clock to make sure these buildings are ready in time. A lot of the credit should go to the man leading the project, Ukrainian Deputy Prime Minister Boris Kolesnikov. He has pushed people to work faster because, according to him, "If we lost Euro 2012, we would never have the chance to organize anything ever again." So, at a time when the draw for Euro 2012 is just a few days away, rest assured. Both Poland and the Ukraine will be ready for kick-off. Euro 2012 will have been a huge oraganizational undertaking for both Poland and Ukraine. That is also the last European Championship with 16 participants. From 2016 onwards 24 nations will participate. That means host will have to provide additional stadium infrastructure. Big countries such as France – the 2016 host – will have no problems on that issue. But Portugal in 2004, Austria & Switzerland in 2008 as well as Poland & Ukraine next year were respectively will be stretched to their maximum. How is UEFA going to find more than maybe a handful of suitable host countries for such a big tournament? I do NOT think that a country like the UKRAINE should either be called a european country nor should they host the European Championship. Do people actually know what is going there right now to prepare this country for the championship??????? Houses being torn down, people just left on the streets with NO remorse, dogs being burned ALIVE in some sort of portable ovens, so that the streets are kinda cleaned of from stray animalsso that drunken fans can just puke their gutts out on "clean" streets???? To my mind championships should NEVER be hosted in 3rd world countries and THX Klitscko, I thought you are a MAN, but you are just a puppet like any other politician. Go on kissing but*ts, and close your eyes to reality. Organizers and co-hosts Poland and Ukraine will put up a grand show. Wishing the football teams of the co-hosts all the very best in their on-field efforts. Very positive write up by Senhor Pedro Pinto. Pedro, Pedro, Pedro, you should be ashamed. In your little piece about who can beat Spain (at the moment it appears half of Europe can to be honest) not ONE word about the Dutch. I can see how the Spanish would want to ignore them since if they'll meet at the Euro's the Dutch will definitely come on top, but last year you claimed the Netherlands (not Holland btw) would win the World Cup. Sloppy work, Pedro, very sloppy work. @lefthog, I doubt Platini will answer that question truthfully. Ofcourse he'll want only the big countries to organize the Euro's, more chances for a mediocre France team to win because of home advantage. And don't forget: the bigger the countries, the more opportunities for the sponsors. Want it or not, but Ukraine IS a European country. If you disagree, initiate moving the Ural mountains further eastwards. Your statement about people thrown out of their houses is LIE. Houses being torn down – WHERE??? Anyway, welcome to Ukraine. Come and see by yourself. I do not recommend to ride to Ukraine. Ukraine is an unsafe country. Do you want to know why? Write me. all of you remember – hatred,intolerance leads to war, Ukraine is the same country like others in Europe. We are thrilled that the matches will be held in eastern Europe and can't wait to tour new exciting cities and stadiums ..in peace and love!